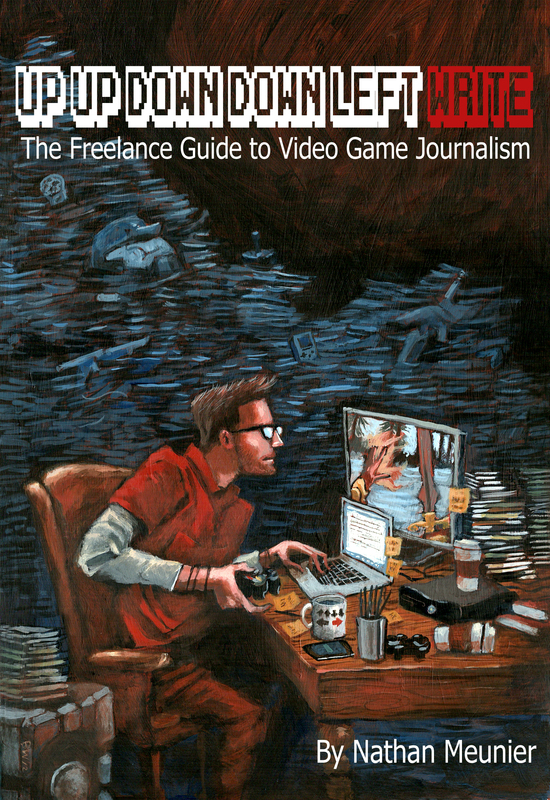 So once upon a time some freelance writer dude who makes a living writing about video games for lots of awesome magazines and websites across the universe had an idea: to write a book and jam-pack it full of in-depth, useful advice for aspiring game journos and established writers looking to carve out a career freelancing in the game industry. Oh hey, that’s me! And the book? Up Up Down Down Left WRITE: The Freelance Guide to Video Game Journalism. It’s coming out in just a few more months! Here’s an update on the project, where it’s at, and how you can help (if you feel so inclined) to spread the word as we gear up for this launch, DIY style. So what is this thing? Up Up Down Down Left WRITE is a detailed how-to guide that gives you everything you need to break into the gaming industry as a freelance writer, then build up towards making the jump to a full-time career covering games and the people who make them. Designed for both total newcomers and more established writers who are already in the thick of it, the book covers a wide range of topics, from how to generate amazing pitches and get the attention of editors to juggling the more challenging aspects of building a freelance career in this unique and exciting industry. It’s based on years of professional writing experience both inside and outside of the gaming industry, and it’s backed up by countless hours working with editors and talking shop with freelance colleagues across the industry. But now that you get the gist, enough parseltongue marketing speak. Since successfully Kickstarting the book in Sept 2012, I’ve been able to finally finish the project, polish it up, and prep for birthing it into the world. Yes, it’s my word baby. Over the past few months, I’ve been working very closely with my esteemed colleague Andrew Hayward, an industry freelancer powerhouse and editor at Mac|Life magazine, to edit the book and expand on any sections that needed tweaking. We’ve just finished that process, and we’re super psyched with how it turned out. I’ve also lined up a really awesome guest to write the foreword. Stoked! At this point, the book is tentatively scheduled for a public launch in late August 2013. Foregoing any production SNAFUs, you should be able to buy both digital or print editions by that point. Kickstarter backers should have most of their goodies and early copies in-hand before that, though if there’s enough interest I may figure out some kind of pre-order setup for anyone who wants to reserve a copy of the book before launch. Now I’m diving into pre-production for the print and ebook editions, while also cobbling together a grassroots online marketing campaign to get the word out about this thing. That’s where I need a bit of help. Press, Publicity, Social Media (and YOU)! With the book slated to launch in August, I’ll be looking to line-up as much press and social media love for the project as possible leading up to and right around the release window. To get the ball rolling, I just launched an official website for the book (http://freelancegamejournoguide.com/), which has some good starter info up there and a sample chapter you can check out. There’s also now a dedicated Twitter feed for the book (@gamejournoguide), if you feel inclined to follow it and RT to your peeps (or Tweeps? Tweepers? Wha?). If you’re on the Facebooks in Facebook Land, you can LIKE the Up Up Down Down Left WRITE magical facebook page thing. Doing any or all of these things will make me love as a human being (unless you’re not one), or, failing that, at least you’ll be connected to the latest news on the project. If you’re an editor or writer who is in a position to run coverage in your magazine or website – be it news, an interview, a book review, a podcast appearance, or whatever – please get in touch. I’m available for that kind of stuff, and I’m also building a press list of outlets and individuals interested in running coverage of some sort. I’ll be putting together an official press release to send out closer to launch too. Additionally, I’m making a list for review copy requests. I’ll be sending out a limited number of digital copies to press, bloggers, and other media-type folks. Early “reviewable” copies will be available soonish (AND you don’t need debug unit to review them! HAHA! I made a funny!). Keep in mind these will be in digital PDF format only – I don’t anticipate sending out many physical review copies, because that gets expensive quick. Also, please only request a review copy if you are in a position to actually write up review coverage. Thanks! So yeah, if you’re a member of the press (games or otherwise) interested in generating coverage, don’t hesitate to contact me. Same goes for other folks who run websites (focused on gaming, freelance writing, etc.). And if you’re just some random dude or dudette on the internet who feels like sharing this on Twitter, Facebook, or anywhere else, that’s cool too! Much appreciated. High fives! This entry was posted in Shop Talk, Up Up Down Down Left WRITE and tagged book, freelance game journo, freelancing, game journalism, how to, kickstarter, nathan meunier, release date, the freelance guide to video game journalist, up up down down left write by nmeunier. Bookmark the permalink.